Isn’t it FUN to experiment with art supplies! That is how new techniques and styles are created! 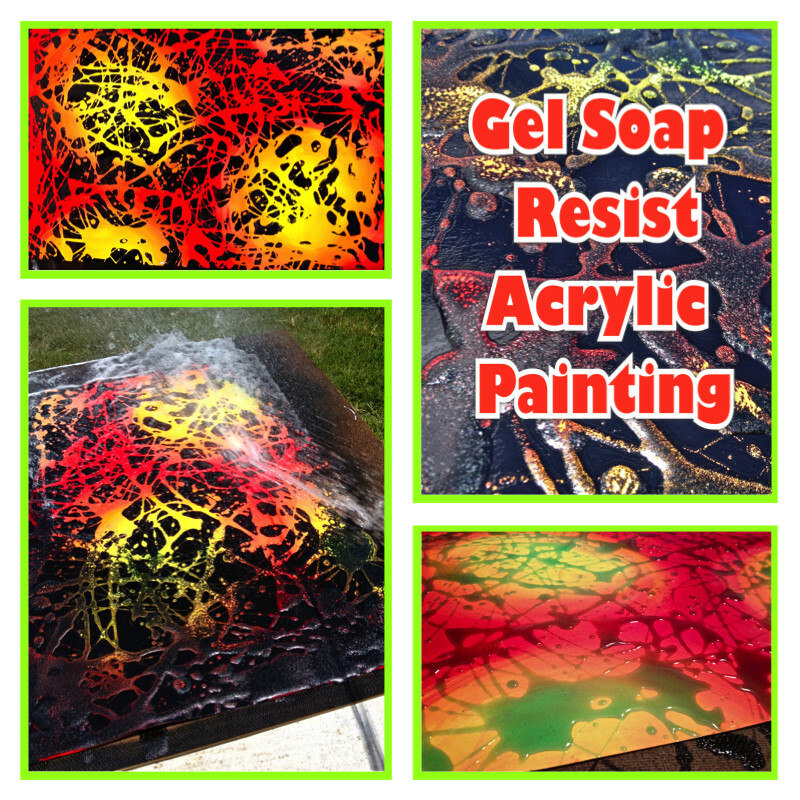 The GEL Resist technique is one of my favorites and TONS OF FUN!! I came across this technique on Pinterest and thought it would be fun to do with my painting art camp I taught a couple summers ago. 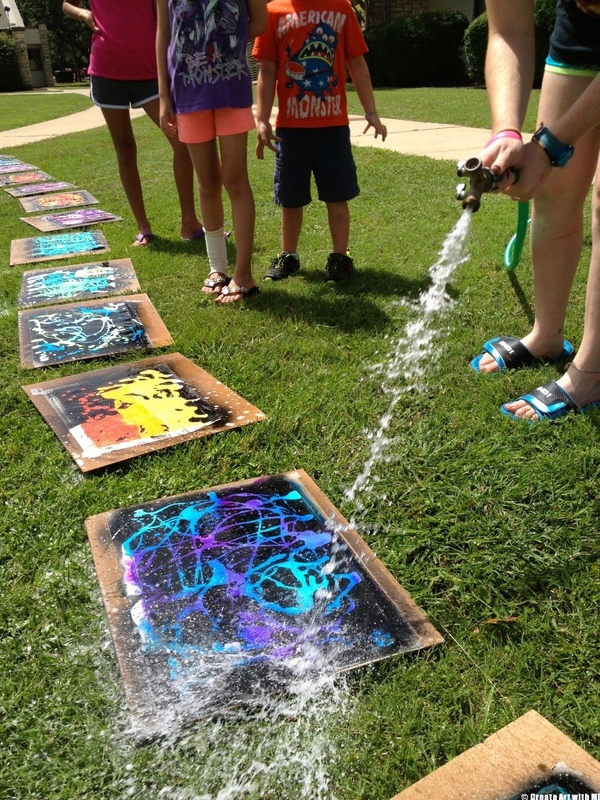 This is a super fun and engaging art project for after school art or art club! I have done this with elementary through high school students and their reactions are always the same-WOW THAT WAS SO MUCH FUN!! Paint the THICK PAPER with ACRYLIC Paint. Blending colors that are next to each other on the color wheel looks best. Its also fun to make simple designs like large circles! You could paint the first layer with spray paint. Let dry completely. Acrylic paint applied to surface-COMPLETELY! With a spoon, drizzle gel dish soap randomly all over the surface. Liquid soap drizzles over surface-make sure to leave some areas uncovered!! In a ventilated area (outside is best), spray the entire surface with spray paint. Let strand 10-20 minutes making sure the spray paint is dry to the touch (may take longer depending on temp & humidity). 1. Make sure the type of paint is ACRYLIC paint (if you use tempera or poster paint instead these will wash right off!). 2. It is best to use a MATTE ACRYLIC paint, NOT glossy. If the paint is glossy, it won’t have a “tooth” for the spray paint to attach on to. 3. Don’t apply the Gel soap over the whole canvas– instead drizzled in only some areas. If the whole canvas is covered with soap, the spray paint will have nothing to stick to & will wash off. 4. Make sure to let the spray paint dry enough before spraying off. 5. Spray water on a low setting-if the hose is on too high pressure or sprayed for too long all the paint might wash off. 6.The surface MUST be either THICK Paper (90lbs +) or a hard surface that has been gessoed or primed. We used 140lb Canson Watercolor paper. Try it out yourself & let me know how it goes! If you choose to use ANY part of this blog (pictures or written information), please link back to Create Art with ME! What kind of spray paint did you use for this projects? Hi! I think we used Krylon Gloss Black Spray Paint, it was close to $5 per can & with my whole camp we used part of 2 cans (both going at the same time). I do NOT recommend using the cheap stuff, it did not work as well! Hi Rajean, My school has a big open grass courtyard in the middle-this is wear we sprayed off our paintings. I did not see that there was any damage to the grass, nor did I get any complaints from the facilities manager or administration. That being said, I would encourage you to spray these off in an area of low traffic as it might take a little while for the spray paint to dry on the grass. The soap did not affect the grass. Have fun creating-this is a really fun project!! 5. The hose was on too high pressure or sprayed for too long. Please check if any of these reasons were the cause & try again. Let me know how it goes again-I want to make sure you have a successful experience!! What does that mean? Do you mean you should put the paper against a canvas or to use a canvas? Hi, sorry I need to remove that caption. Paper does work best, the canvas seemed to wash the paint off more, even where there was no gel soap. I used a 90lb. Paper taped to a Masonite board-this is what I would recommend! Enjoy-this is SO MUCH FUN!! How did the paper react to being hosed down (was it still flat after it dried?). Do you think a piece of cardboard would work? We used a thicker piece of paper (90lb) and limited how much we hosed the paper off, so the paper reacted well & remained intact. A 140lb watercolor paper would probably handle more hosing off, butI don’t think more is needed. We also let it dry completely on the board we taped it to (taped with masking tape). would a canvas tile work whereas a stretched canvas does not? this looks very interesting and anxious to give it a try! Are you talking about canvas panels (canvas mounted on boards)? If so, I haven’t tried that yet. What ever surface you try MUST be gessoed! If you try it, let me know how it goes and I will add your results to the post. What is a brand of gel dish soap? I am not sure I know what “gel” dish soap is. I love this idea and think my adult students with disabilities could be successful doing this. I look forward to trying it . I have all the supplies but wondered about the soap. Is it just regular dish soap…like dawn or such? Your instructions say use the paper, but other hard surface that has been gessoed will work. In the comments you say that whatever surface you use must be gessoed. Does this include the paper, or is it only for using a material other than watercolor paper? Thanks! Looking forward to trying this one. I gessoed all the surfaces-hard, canvas or paper! This is SO much fun!! This looks sooo fun!!! Do you think it would work on T-shirts? Thanks! It is fun!! I’ve never tried it on a t-shirt. Because you are apraying with spray paint, I’m not sure you’d want that on a shirt and I dont think it would be washable. Would this work on a canvas tote bag? Most-likely yes, but t you might want to mask off the areas you don’t want excess spray paint to get on.